Turkey Trot Acres is soon to rebrand with the “Peace Tree Lodge”. The Peace Tree will be unveiled on Aug. 11. Provided photo. Built 31 years ago utilizing cut trees, Turkey Trot Acres was host to some of the largest turkey hunts in the nation; but with the declining turkey population, the Clare’s aren’t fading away, they’re switching to hosting various events, full time. Near the road is an entrance that will lead guests to the lodge’s representation, the Peace Tree. Going back about 100 yards, the small entrance off the main drive will lead to a Red Oak that’s approximately 153 years old. Historically, the Peace Tree is known as a “Tree of Peace”, in which weapons would be buried. It is the hopes of the Clare’s that their “Peace Tree” will serve to spread peace. Professor Louie & The Crowmatix will take the stage on Aug. 11 at Turkey Trot’s Peace Tree Lodge. Photo provided by Professor Louie. The “Peace Tree” will be unveiled in conjunction with an upcoming show on Aug. 11 that will embrace peace during “A Sunset Serenade #1”. The show will bring guests back to an era of peace for a Woodstock Rockin’ Review featuring Professor Louie and The Crowmatix, who will be playing the music of The Band, New Riders of the Purple Sage, Bob Dylan, Hot Tuna, Van Morrison and more, along with Michael Falzarano, guitarist with New Riders of the Purple Sage. Mike Powell will also be a special guest at the Rockin’ Review. The Clare’s billed the upcoming show as a compliment to their rebranding. Tickets for this event are $100 for VIP, which includes an earth, wood and fire buffet; VIP seating; and a meet and greet at the event. There are a limited number of tickets available at www.brownpapertickets.com/event/3395629, or at turkeytrotacres.com. The doors open for VIPs at 4 p.m. for the buffet. For those attending the show only, the doors open at 6:30 p.m.
Live music begins at 7 p.m. A cash bar with wine and beer will be available. A lodging and transportation package from Tioga Downs Casino Resort is available by calling 1-888-946-8464. Tickets for the show only are $60, and can be purchased at turkeytrotacres.com. Therefore it is fitting that the Clare’s are presenting the “The Woodstock Rockin’ Revue” lineup of artists to kick off their rebranding. Bringing back the vibe from earlier days is Professor Louie & The Crowmatix. According to the band’s website, www.professorlouie.com, Professor Louie & The Crowmatix began as the studio backing band for Aaron “Professor Louie’s” musical productions for the Rock and Roll Hall of Fame Inductees, The Band. Rick Danko christened him Professor Louie due to his work and friendship with The Band. This GRAMMY-Nominated Woodstock, N.Y. group plays 150 shows a year in the U.S. and worldwide. They have performed at the Thunder Bay, London and Windsor Festivals in Canada, The Tondor Festival, Falcon Ridge Festival, The Sellersville Theater, Pa. and BB Kings in New York City, – The House Of Blues in Los Angeles and The Bearsville Theater in Woodstock, among others. 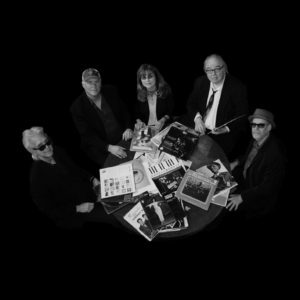 In 2018, Professor Louie & The Crowmatix released a six song EP on Funzalo / Woodstock Records, The Lost Band Tracks. This recording has been receiving great reviews. For the Aug. 11 show, Professor Louie, in a recent interview, referenced it as being part of the “The Lost Band Track Tours”. 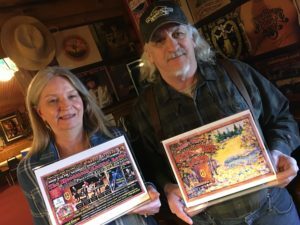 At the show they will have, on hand, “The Lost Band Tracks” CD, as well as other releases that include “Crowin’ The Blues”, released in 2017 on Woodstock Records and “Music from Hurley Mountain”, released in 2015 on Woodstock Records. During the interview, Professor Louie also talked about uniting with Michael Falzarano, from New Riders, for the Aug. 11 show. The two have also played together now and then, and are on a few of each other’s albums, according to Professor Louie. Describing their music, their genre touches back on the roots of rock and roll; it goes back to the fabric that made up rock and roll. Then, they add in a few songs that are new. “Guests will get a cross-genre of music,” Professor Louie exclaimed. Back home, the band continually writes music and welcomes a host of musicians at LRS Studios, located just 15 minutes south of Hurley. And its members live around Woodstock as well. “If we’re not playing on the road, someone is in the studio,” Professor Louie added. Other members performing include Gary Burke on drums. One of the best all time drummers, he performed with Bob Dylan’s “The Rolling Thunder Review” and also recorded and toured extensively with Joe Jackson. Miss Marie, vocals, percussions and keys, performed and recorded with Levon Helm, Rick Danko, Garth Hudson and more. She is also the composer of many of the band’s original songs. Frank Campbell, bass and vocals, was Levon Helm’s music director with the Woodstock All-Stars, touring around the country. He also performed with Steve Forbert on tour. Michael Falzarano, guitar and vocals, is best known for his 20 years with Jefferson Airplane spin off Hot Tuna, and for the past 13 years with The New Riders of the Purple Sage. He is currently a member of The Airplane Family and Friends. Falzarano also spent time touring and playing shows with Garth Hudson, Levon Helm and Rick Danko of The Band. John Platania, guitar and vocals, is known for his great performances with Van Morrison for over 30 years. He collaborated with Van to create some top hits, such as Domino. The span of years shared between these musicians’ sums up this rockin’ review and “A Sunset Serenade”, a transition towards peace at the “Peace Tree Lodge”. This show is brought to you by Live Space Entertainment and Howling Dog Productions. 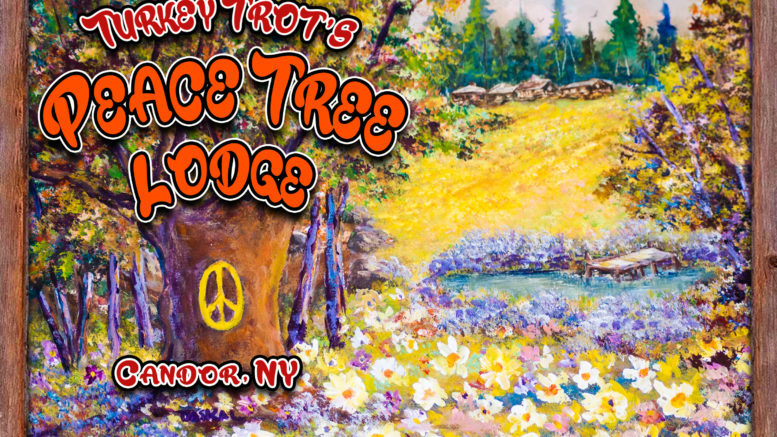 Be the first to comment on "The softer side of the hunt; Turkey Trot Acres rebrands with ‘Peace Tree Lodge’"